Three Dressing Room Hooks. That’s All I’m Asking. Three. Sure, lighting that doesn’t make me look like a nauseous zombie hippo would be great as well. And maybe stiff drinks, if I’m trying on jeans and/or swim suits. And some soft jazz to muffle the collective grunts of pulling things on and reaching for zippers. But those things are probably for better stores than I can afford. So back to the three hooks. One for the stuff I haven’t tried already. One for the stuff I’ve tried and am planning to buy. One for the stuff I’ve tried and am not planning to buy. If you really love me, give me a 4th hook for the maybes and/or my purse and/or the clothes I came in with. But three would be enough to make me happy. Now, I know you’re only letting me try 6-8 things on at a time anyway, and in your mind, you think I can keep track of them without additional hookage. You’re adorable. I suspect your mind doesn’t have a list of mom/small business owner/caregiver things cluttering up the corners and oozing into the doorways, or you would know better. I am functioning on the edge of chaos, mentally, most of the time. 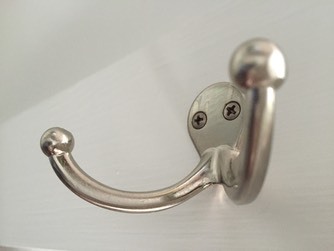 Your three-hook contribution to the control of my day will be more appreciated than you think. This is a classic case of an interface that is designed by people who a) don’t apparently use it and b) don’t apparently talk to anyone who uses it. It’s also a classic case of ROI. For one more hook, you make me happier in your dressing room. And happy people spend more. Happy people like the way they are treated, and have a good experience with your brand, making it more likely they’ll come back. Happy people are willing to try more on, to come back to the dressing room and use it again, and again, to buy more. Now about the lights . . .